We’re back on the Canal du Centre. I was hoping that heading in the opposite direction would be a little easier. Unfortunately… it wasn’t. 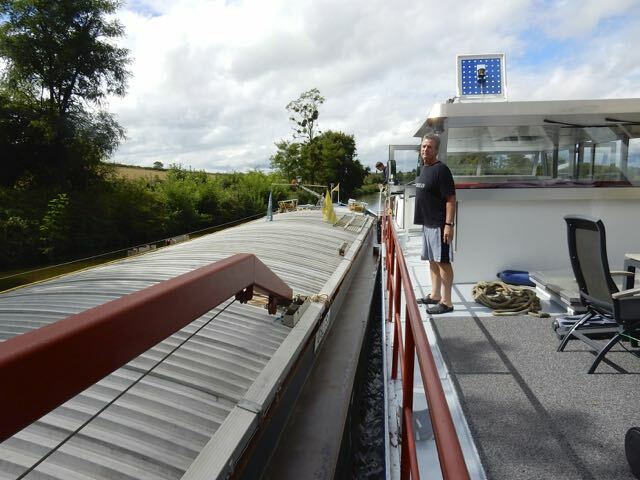 There were just as many tight turns coming out of the locks or after the bridges that were impossible to negotiate without touching the sides of the canal. The area between Digoin and St. Leger sur Dhune at one time was a rich mining area with large deposits of coal, iron, lead, and clay. It was especially known for its pottery and ceramics. They still do some ceramic work in the area, but just not the beautiful tableware or architectural details the area was famous for. 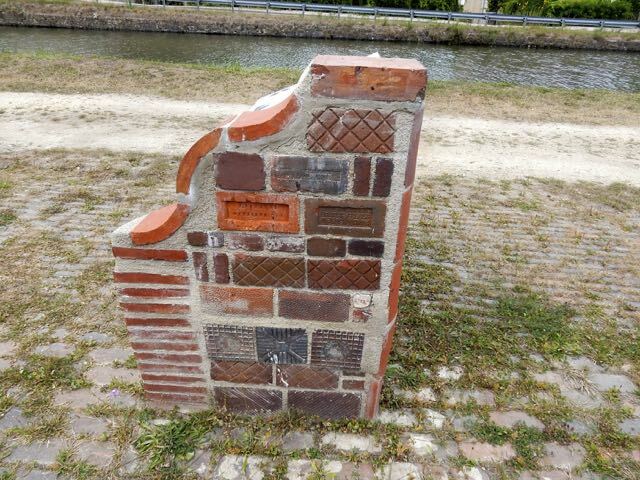 We went by one factory on the canal that made toilets! Sitting in their yard were literally thousands and thousands of toilets wrapped in clear plastic waiting to be shipped. How am I supposed to negotiate a turn like this in a 130 ft. barge? 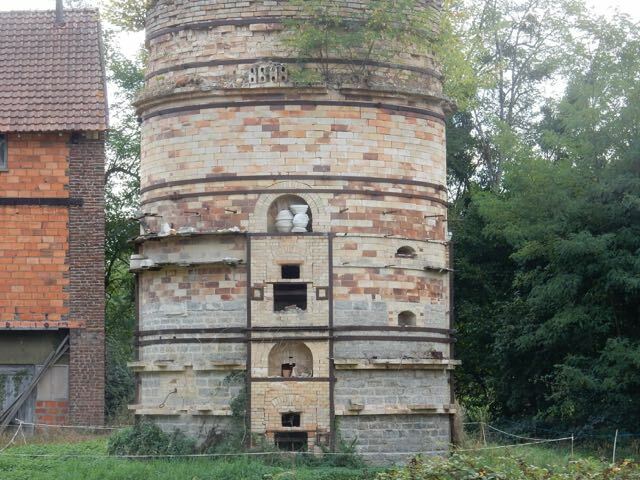 An old kiln with some pottery still on display. 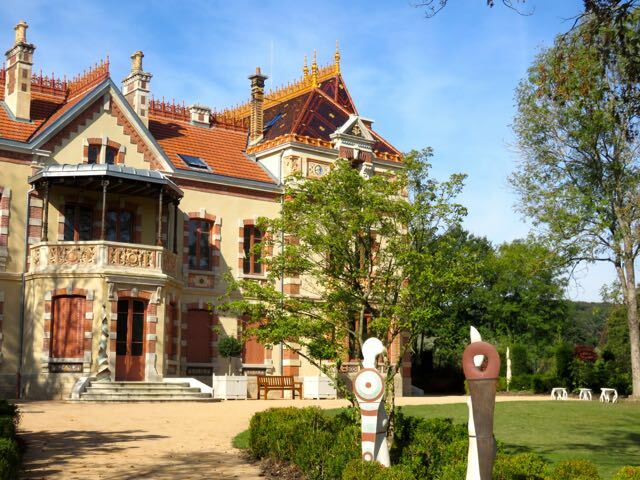 This beautiful old home covered with amazing ceramic details. Note the roof ridge of glazed ceramic tile. 190 million years ago the area was a shallow sea. 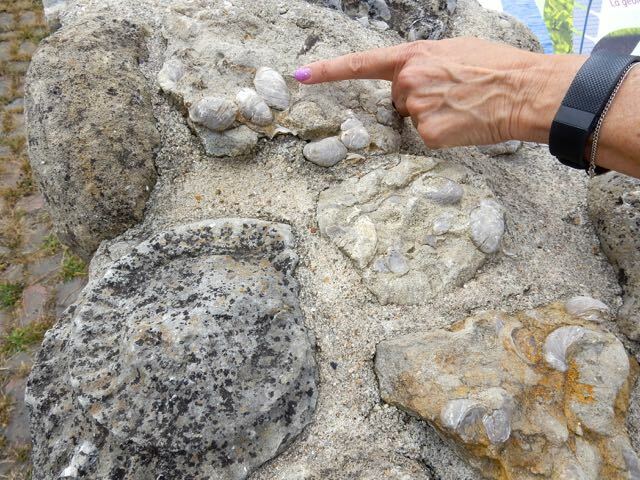 Fossil shells can still be found in the Genelard Bluestone that was once used to construct many a Parisian building. Fine pottery, along with paving stones, roof tiles and bricks for building at one time were all made in the region. 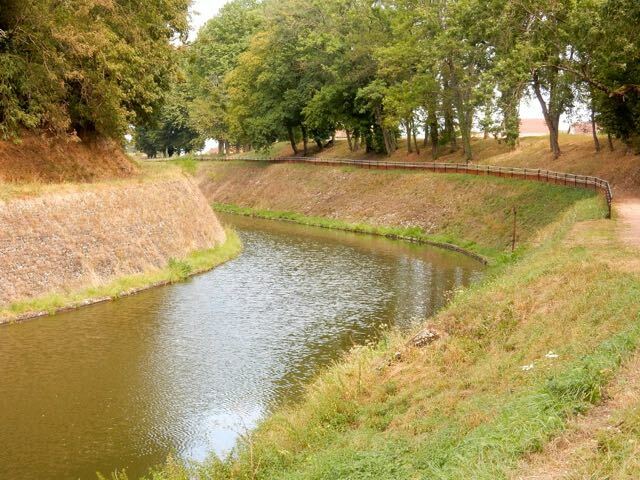 There were four narrow gauge railways that brought materials from the mines and factories to the canal. 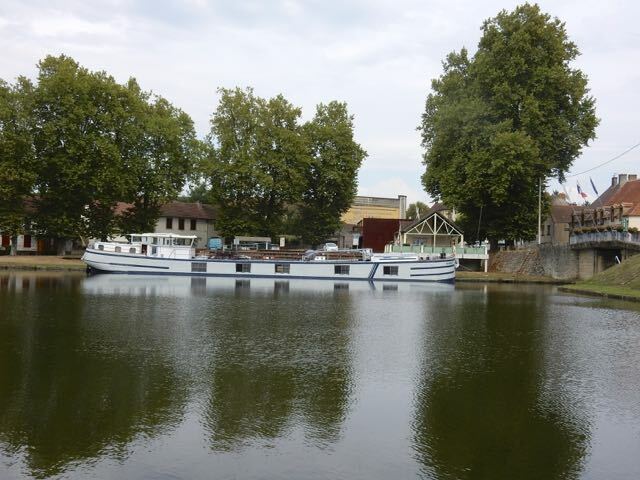 30 to 40 commercial barges a day would pass through the locks transporting goods to Paris and the Mediterranean coast.Now we are lucky to see one or two commercial barges on the Canal du Centre. Actually I’m not sure I would describe having to cross a commercial barge as being lucky. 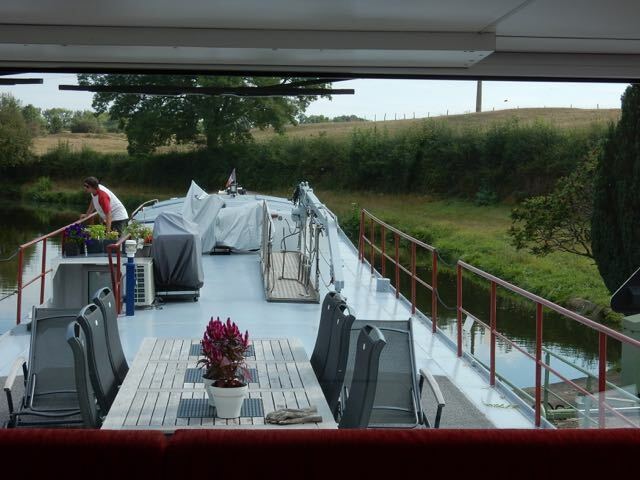 It is more of a challenge, though the commercial barges have always been friendly. I understand that with the smaller boats they are not so pleasant. We heard one commercial barge captain that was so furious he told a smaller pleasure craft over the radio that he knew where to find them. Of course, the pleasure craft had done everything wrong when he tried to cross the commercial barge. Sea shells deposited millions of years ago when the area was a shallow sea. Some of the clay products made in the area. A very close encounter with a commercial barge. 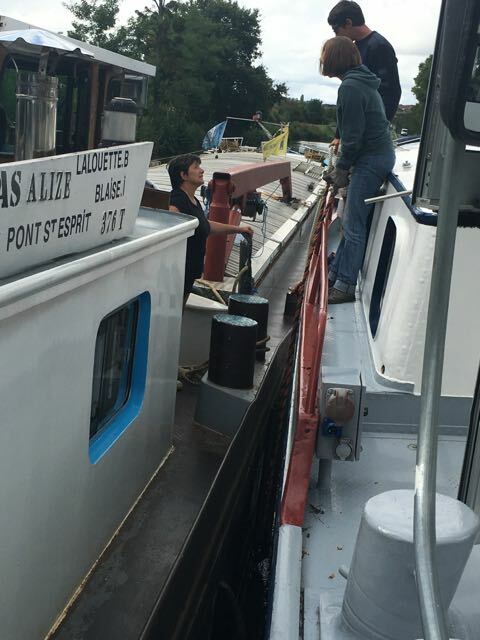 Note the blue board on top of the pilothouse. This tells oncoming traffic that we wish to pass on the right side rather than the more typical left side. A friendly encounter with a commercial barge. We touched as we passed, but there was no harm done. 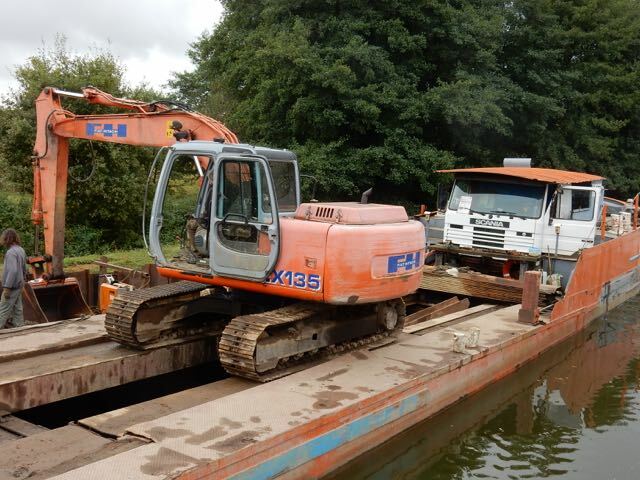 An old Scania truck cab was used as a pilothouse on this commercial barge. During World War II the Germans set up an internal border within France. To the North was the occupied zone and to the South was the free zone. The border ran through the middle of the town of Genelard. Rabelo moored in Genelard. The bridge in front of us was the border between the occupied zone and the free zone. I took this picture from the helm station as we were exiting a lock. You can see we are still in the lock in the lower right portion of the picture. It’s impossible to turn inside the lock as it is so tight, and yet the canal is making a hard left turn right in front of us. In Paray le Monial I took Lisa out to dinner. She had been cooking all week, and needed a break. She managed to find a restaurant with a Michelin star in this little backwater town best known for it’s basilica dedicated to the Sacre Coeur (Sacred Heart). The basilica was built as a small-scale version of the famous Abbey of Cluny. The restaurant Jerome Brochot turned out to be one of those amazing surprises. It was the kind I talked about in one of my recent blogs. The French really know how to dine. Over the years we’ve learned to appreciate what they have brought to the culinary experience. 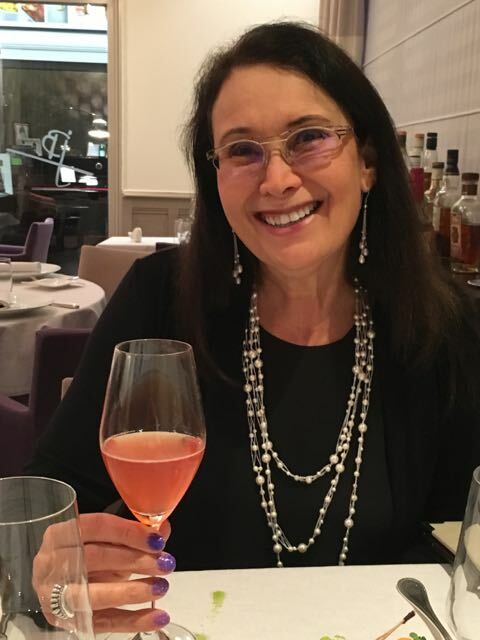 Lisa and I have always loved wine so whenever we go to a nice restaurant we order a bottle, but we’ve learned from the French. The waiters consistently asked us if we wanted an aperitif. We always said no figuring that a bottle of wine between the two of us was enough alcohol for one evening. As I said, we’ve learned! Now whenever we go out for a special meal we always get a before dinner drink. There’s something about the way it sets the tone and invigorates the taste buds in preparation for the gastronomic experience. The other course we’ve learned to appreciate is the cheese course, which is served between the main course and dessert. 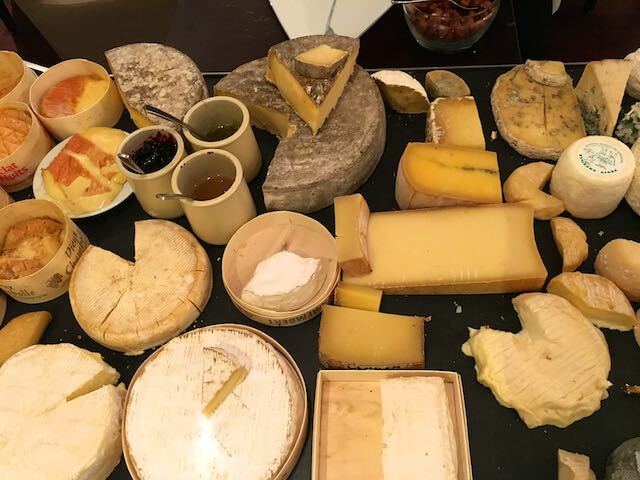 France supposedly has over 750 different cheeses. We’d like to try everyone. Lisa enjoying an aperitif before dinner. These are all cheeses from Burgundy alone. How do we choose?